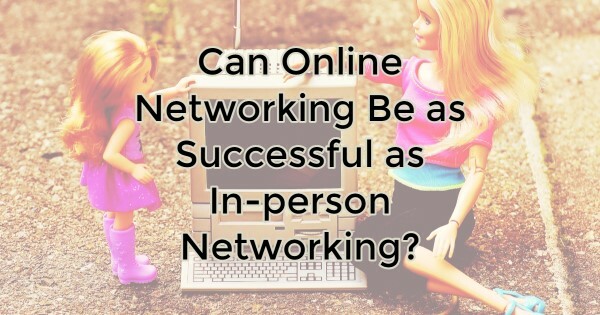 Can Online Networking Be as Successful as In-person Networking? Today’s trend of overscheduling is taking its toll on all of us. From work hours that go well over the traditional 8-hour work day to shuttling children or grandchildren to all their different activities; from time volunteering to time dedicated to professional development, who has the hours for networking at a scheduled event? Very few of us. Yet if you want to grow your business and improve referrals, you have to go out and meet people. Or do you? Is it possible to network online and get the same benefits from it? These are both pretty great benefits but there is a downside. Online networking is like a long-distance relationship. It can work but it takes an awful lot of effort because you don’t have the bright and shiny attractions of a sparkling smile and eyes that put you at ease. Plus online networking is often as awkward as a blind date. Look at LinkedIn. You connect with people you already know professionally. Many LinkedIn users are hesitant to accept invitations to connect with people they don’t know. They’re worried they’ll be pitched or the connector is just using them to get to someone else in their network. Only about a quarter of LinkedIn’s users are active on the site each month. It’s hard to connect with people who aren’t there. LinkedIn does offer groups but often these groups are filled with people simply pushing their own content and there’s very little getting to know one another. Even people who ask for opinions are usually only doing so in order for you to read their content or click on their site. Facebook has similar limitations. You can’t just “friend” someone you don’t know. There’s no search on Facebook for people who are interested in connecting for business purposes. Twitter is a little better because people are having conversations and you can follow anyone you’d like without them agreeing to it. The problems with LinkedIn and Facebook is that what you see is a stream made up of your friends or connections and contrary to what Zuckerberg may think, from a professional standpoint, you may not really be interested in what your friends are saying, particularly if they work in different industries than you. There’s no comparison and better way to instill trust quickly than through a firm handshake and a sparkling smile. Conversation is easier in person and there are fewer distractions. A business card exchange also gives physical proof of the conversation and can be easily used for follow-up. But in-person networking can be intimidating for introverts and quite draining. Often in-person events are comprised of the same crowd of pushy sales people. This turns a lot of people off. Plus it’s difficult to make the time. Networking events are either first thing in the morning or after work. This isn’t optimum for a lot of business owners. Ultimately whether online or in-person is better comes down to you and your objectives. If time is a premium and you work strange hours, online networking might be a good fit. However, it takes effort. It’s a whole lot easier to go to an in-person event and walk through it half-heartedly and still make a few connections. Online requires you to be on and interested in exchange. You also need to choose your platform well. Twitter or a Facebook group may be the easiest way to connect with like-minded people. But there’s no one out there telling you that you can’t do both. It’s not an either/or option. You can use social media for striking up quick conversations and identifying links. It’s also perfect for doing research on who you’ll be meeting or are interested in meeting. But it doesn’t have to replace in-person networking. An in-person meeting is still ideal for addressing the generational divide and forging deep, meaningful relationships. In business you need both so there’s no reason to neglect in-person networking for online opportunities and online ops shouldn’t be overruled. Both have their benefits and both will help you grow your business and your personal brand.